Do you want to start a profitable layer poultry farming business? Commercial layer poultry farming business has a great market demand not only in Bangladesh but all the countries. Also, it’s an established business that you can start successfully. And it’s not only dependent on agriculture but the economy of Bangladesh is dependent on agricultural related products as well. Moreover, the main sources of animal protein for Bangladeshi people are the poultry products like meat and eggs. So, there is a large market for poultry farmers. And one of your options is to settle for poultry farming if you want to start a livestock breeding business. Besides, the supply of eggs is also a major source of revenue generation for poultry farmer aside from the fact that people consume birds and chickens. That’s why the great markets for commercial poultry farming are Bangladesh. As layer poultry farming business is a lucrative one, there are many advantages of starting this business. It’s not only a very profitable business but it needs low investment for both individuals and Entrepreneurs. Since there is a huge demand for poultry products inside the country, you don’t have to worry about marketing your products. 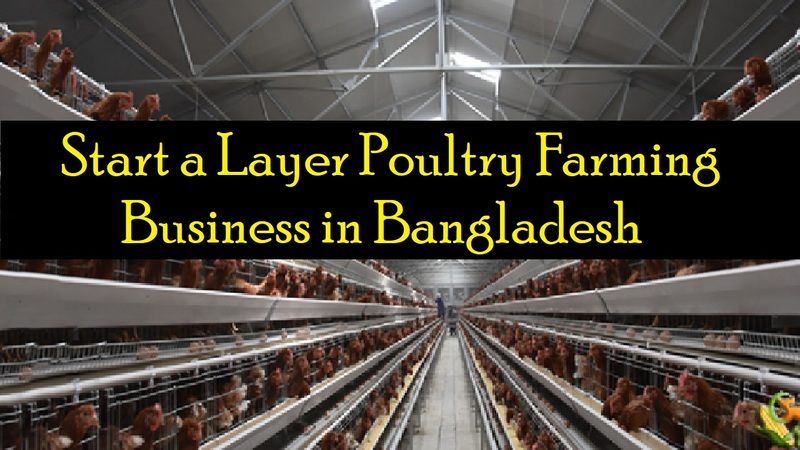 In Bangladesh, layer poultry farming business in the one that never dries up. If you start this business then you can create employment opportunities for the job-seeking unemployed educated people. Also, in the small-scale farming system, you can engage women. It not only ensures the availability of necessary nutrition for the family but helps them making some extra income. Besides, as it has great returns of investment ratio, there is a good chance to be successful in this industry. If you’re planning to start your own layer poultry farming business you should enter the business with well prepared. So, you have to take every step wisely from setting up some basic equipment for raising the birds and marketing your business. Also, keep in mind your competitors that are other similar businesses. And chances are that it will grow fast if you conduct your business carefully. That’s why while starting a layer poultry business; you need to follow some necessary steps. Let’s know what they are. As layer poultry farming business is composed of both direct and indirect competitors, you must have a solid business plan. The project will focus on having a thorough understanding of the needs and preferences of the customers in terms of competitive advantages. The selection of a suitable location is another initial step before starting a layer poultry farming business in Bangladesh. You can select either a separate place that is in a quiet place and far from your home or in your home. In this case, the most expensive part of commercial poultry farming business is to buy land if you need. It’s important to select the perfect farming system while starting a layer poultry farming business in Bangladesh. And for commercial poultry farming in Bangladesh, there are the three systems are suitable. As there are numerous highly productive poultry breeds available throughout the globe, some of them are very suitable for commercial purpose according to the weather and climate of Bangladesh. While choosing a proper breed for your desired production, you can start raising poultry for meat and egg production. If you want to know which breeds are producing more then you should contact your nearest poultry producer. Also, you get the help that you’re looking for if there are the experts in your area. Since layers are used for commercial egg production, there are some layer poultry breeds available which lay more than 280-320 eggs annually. Now, you can sell them for slaughtering purpose after finishing profitable egg production stage. It requires a large farm area when you want to do free-range poultry farming. And as it’s not suitable for large-scale poultry farming in Bangladesh, you have to make a suitable house for your poultry birds so that they can be kept inside the house all the time. And according to the breed and farming system, design of poultry house varies. Also, consider the followings and learn more about how to build a poultry house while making a poultry house. There must be proper ventilation system so that your birds get the good environment to grow. If you feel good and high-quality nutritious food then it will ensure maximum production. That’s why you must feed your bird fresh and nutritious food and it will bring good results. In this case, the commercial poultry feeds are the best for them. You have to buy all the necessary nutritious feed ingredients separately and mix it before feeding it to your poultry birds if you want to feed your bird homemade food. It is best if you can make your own poultry feed for your farm. There are the easiest ways to market your layer poultry farming business in Bangladesh. And the simplest way to sell them in your nearest local market that will be the low cost of transportation also. In addition, there are some direct sales and you should talk to different market businessmen to buy from yours.